The Dolomites are roughly a 5 hours drive away from where I live, so I checked the weather forecast to show at least two days in a row with no clouds. Of course it also had to be around new moon to capture the Milky Way at its best. I scouted the area from afternoon right into the evening to see what spot might work best. Before that I also checked in which direction the Milky Way will appear. There are several Apps that will help you to figure this out, I use Stellarium. 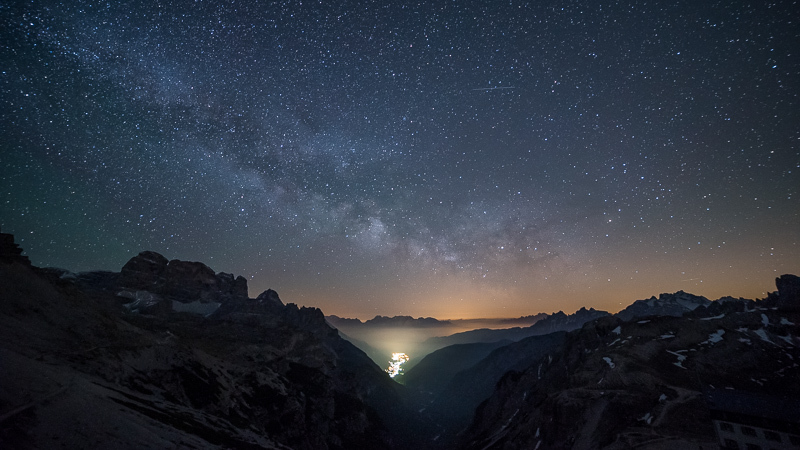 So I decided to come back later, when the Milky Way spans over the valley. When doing astrophotography I always use my A7s, shadow noise and dynamic range at higher ISO are still worlds ahead of the A7rII. For these type of shot I also almost always take panoramas as these will significantly increase the quality of the final image (and also the pixel count of course). This was the first time I used the Voigtlander 35mm 1.7 + 5m filter for astrophotography. As can be seen in my 35mm comparison coma correction isn’t exactly perfect, but stars are far less demanding than cityscapes so I decided to give it a try. 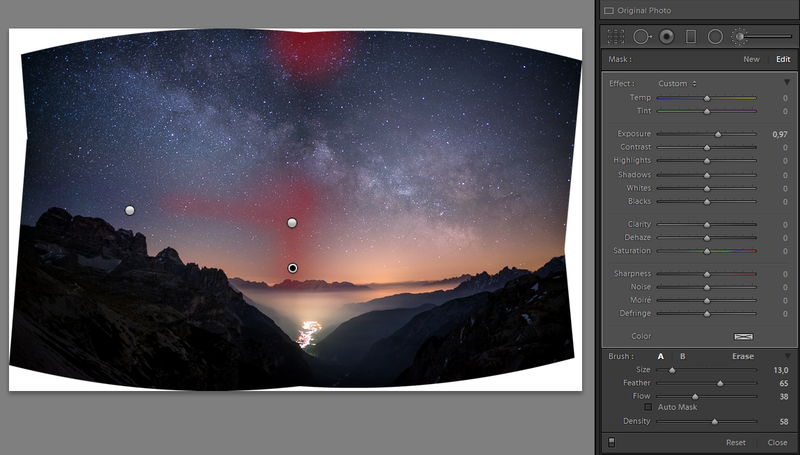 All my bigger tripods have a rotating plate on top (see also this article) so I can easily take panoramic shots. As there wasn’t something very close to the camera in the frame a nodal rail wasn’t necessary in the first place. I exposed for the highlights (town) to not blow them out and lose too much information there. Also 15s is actually a bit too long for a 35mm lens and the stars will already become short streaks, but this will hardly be noticeable in the final image. Unfortunately there is no decent profile for the Voigtlander 35mm 1.7 to correct vignetting, so you will see dark seams where the single images connect. Furthermore the horizon is bend as the camera wasn’t leveled. I also corrected some green color near the left border this way. 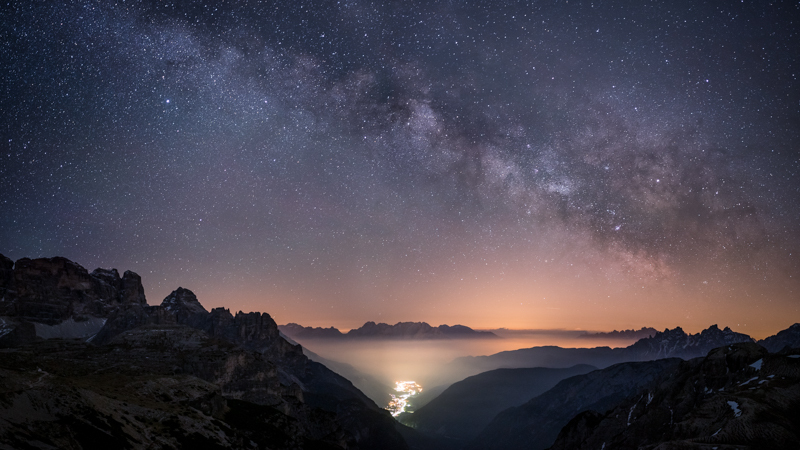 I improved the outcome of the Milky Way with a local brush as well, called “Night – Enhance Milky Way” created by David Kingham, which can be downloaded here. PS: David’s presets and tutorials are very good, so be sure to check them out! Now the image can be cropped to the desired ratio and that’s about it! This is the final image as I uploaded it to flickr. Are you happy with the results you are getting from the 50mm Loxia (and do you use it at f/2.0 for that purpose)? 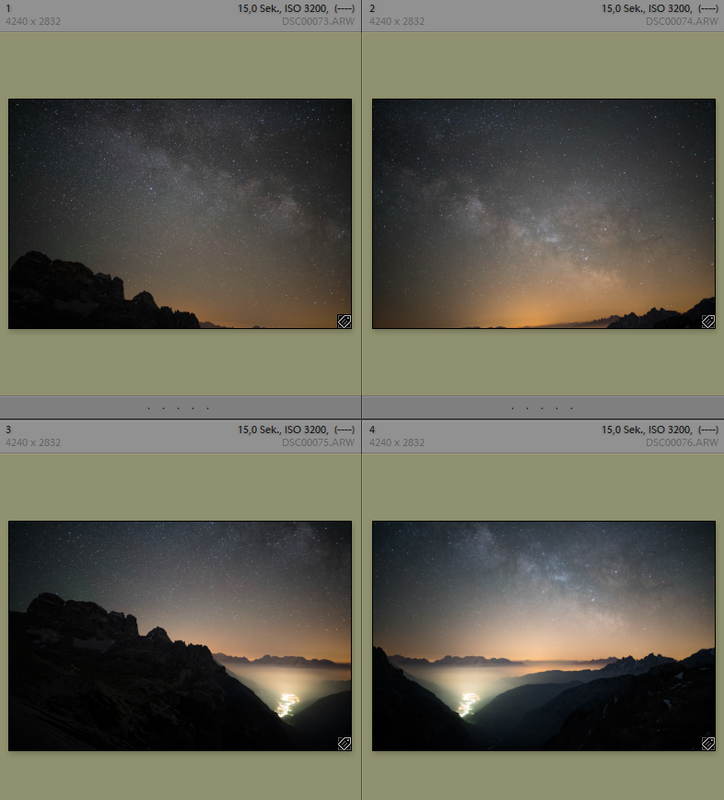 I am asking because I am currently thinking about which ~50mm lens I am going to use for stitching milky way shots. Also I think with longer focal length an equatorial mount would be quite handy. I am using the Sightron nanotracker which I think is the smallest one available and hardly adds any burden to my hiking trips. By using 0.5x speed the image quality can be improved visibly and the blur of foreground is still within control. thank you for your comment and showing me those excellent pictures! I am not really happy with the focus by wire for these kinds of shots though, the Batis 18mm 2.8 already gave me quite a headache in this regard. Nevertheless I will (I actually do already) strongly consider that lens, as it is quite small, lightweight and the optics look very good for that purpose. I was also exploring guidance systems, but at the moment I am not really interested in deep sky and if the image is to be stitched later I can use longer exposure times with longer focal lengths (as I did here as well). Hi. The guidance system is not limited to deep sky shots, but also very handy for astro-landscapes with wide and normal lenses. If you try tracking shots with longer exposure and lower ISO you may find much enhanced details and room for editing. It’s quite amazing! I also hate fly-by-wire focus but for night sky shots I think I can do with it and even AF by A7S often gives me satisfactory results. I might indeed give that Nanotracker a try. When I checked a few days ago what options there are, it was the only one that caught my interest because of small size and weight. Would you mind sharing a shot of your setup? I am still thinking about what ballhead to use on the tracker. Glad to! I’ll send you a mail later. If you want to see more just say so, than I will take a look in my archive! Your link gave me a 404, may you recheck it? Thank you! I would recommend not having high hopes for the new Voigtlander Classic 35mm 1.4. It will probably have less issues with field curvature, but otherwise it will be the same as the (in my eyes) far from great VM 35mm 1.4. Why did not you use your Samyang for the shot? I have a feeling that (at least with a7r2) the amount of detail in a 4x15s stack with iso a bit cranked-up would be comparable, but much easier to process (even longer is doable, but then you’d need to stack sky/ground separately to avoid trailing). regarding the focus (especially for focus-by-wire lenses) I find one of the approaches used to focus telescopes quite useful, i.e. the Bahtinov mask (https://en.wikipedia.org/wiki/Bahtinov_mask). 14mm was also a little bit too wide here. With the A7s in my experience stitching a longer lens will give me better image quality than stacking with a wider lens. Combining both (stacking+panorama) will be even better of course, but also takes quite some more time in post and during the capture. You also have the Samyang/ Rokinon 14mm? In that case you have a very good sample I guess, mine is only sharp in the center unfortunately. 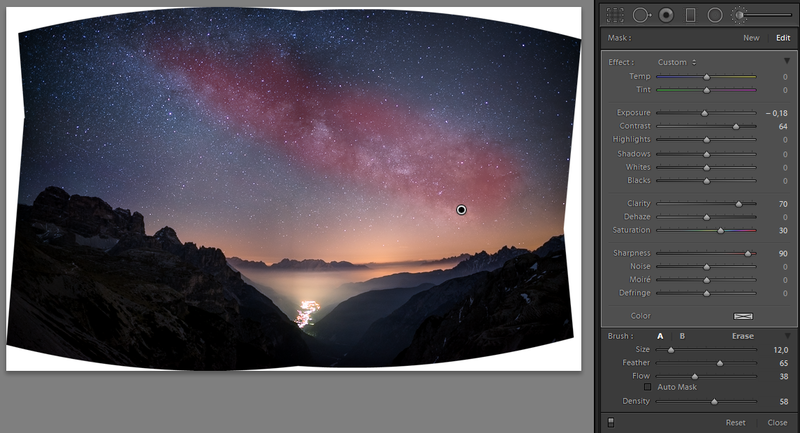 Something that works even better than stitching with a long lens, is making a stack of every part of the panorama. I tried this recently and it works really well. It is a lot of work but it results in an enormous amount of detail. 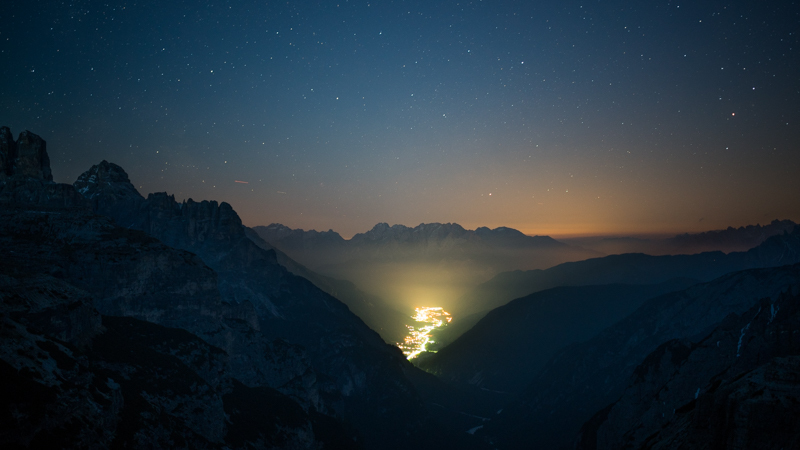 It gave me the possibility to even recover some detail at the horizon without causing to much noise (which is really difficult in the Netherlands due to light pollution). Yes, the shot was taken with a 14mm 2.8 Samyang (MF DSLR version with hilarious distorion). It is a rather decent sample, but I had to try 4 to find this one. Still: I don’t really like that lens. Build quality is very very bad. Furthermore there is no way to easily fix the distorion. I tried all LR profiles, including one I created myself, and also PTLens. With straight lines near the borders they are all loosing it. I am eagerly awaiting the release of the Laowa 15mm 2.0. If it is any good (and from a few shots I took at Photokina it doesn’t look too bad) my 14mm will be retired in a heartbeat. Congrats for this very useful and detailed article! 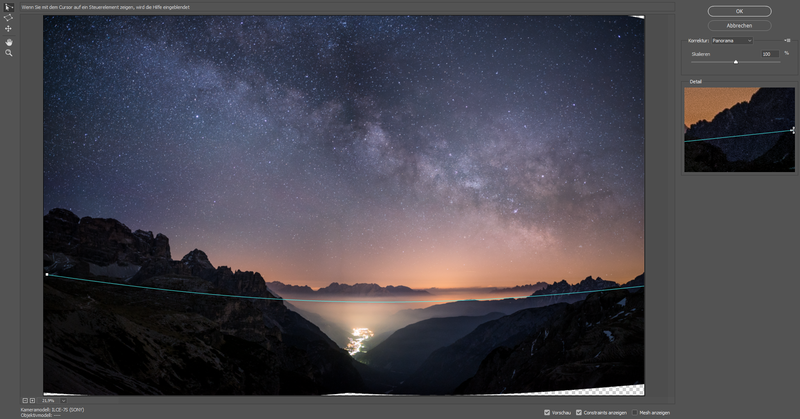 I tried to take a milky way shot in the Swiss alps using this panorama stitching method in LR. 3-4 shots taken with a 35mm on a sony a7, for a vertical panorama. Each shot has more than 50% of the previous shot. Would you happen to have any idea of why this happens and how I could arrange it? Any idea would be much much appreciated !!! Wish that Adobe improves the panorama option of LR ! Vielen Dank für den Bericht. Wird denn das Objektiv ein bevorzugtes Objektiv für die Milchstraße werden? Ich meinte, in einem früheren Test gelesen zu haben, dass es wohl eher nicht für die Milchstraßenfotografie in Frage kommt. Speziell für den Fall kaufen würde ich es nicht (da bietet sich eher das Sigma 35mm 1.4 Art an), aber es lässt sich (jedoch nur mit einem 5m PCX Filter!) gut dafür verwenden. Hast Du diese “Linse” (https://europe.optosigma.com/plano-convex-lens-50mm-diameter-2000mm-focal-length-400-700nm.html/) verwendet? Der Link, den ich bei fredmiranda.com im Forum gefunden habe, führt ins Leere. Taking a panoramic shot with the 35mm lens in horizontal mode you will have range of a 24mm lens (Minus the 20% overlap). In this case you CAN even use an exposure of 20,83 seconds, and the stars won´t show a coma, shooting one row. 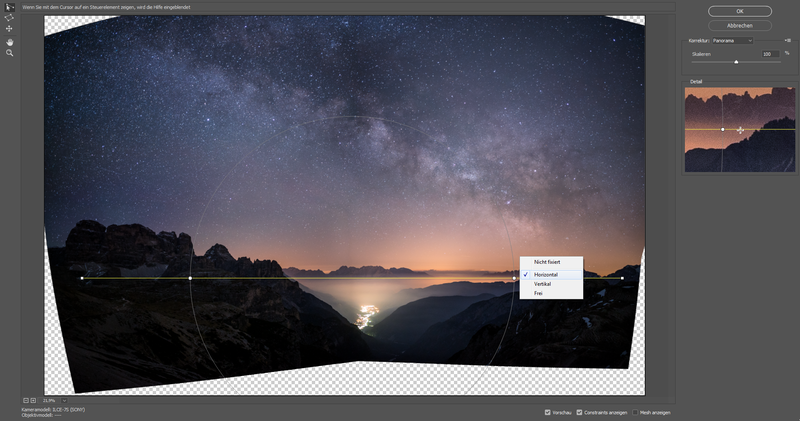 When shooting 2 rows with 4 pictures in a panorama (2 rows over each other) you should have an equivalent of a 14mm lens (two rows: 35 mm x 2/5 = 14mm). 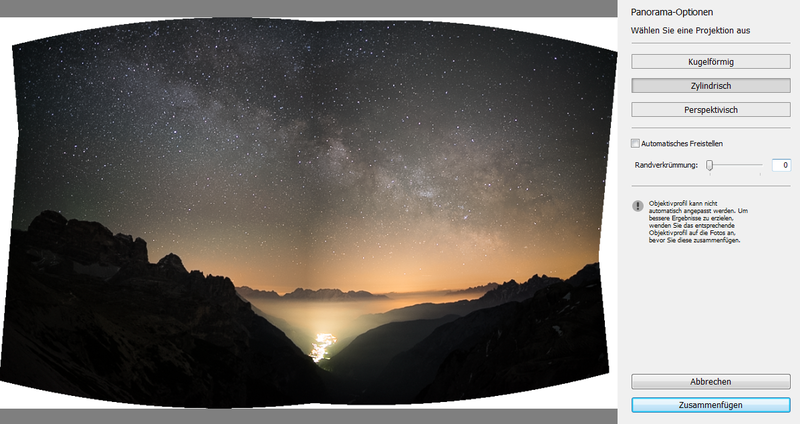 That´s because every picture is taken in the 3:2 ratio and this ratio must be mathematically applied on the panoramic image. Did you get my point? Except this part I like the way you show us, how to manage the astro photography and am very thankful, you share it!!! I am not sure how your comment relates to the article. None of the shots was taken as a 2×4 array. Furthermore it seems you are still going by that 1/500 rule for calculating your exposure time, this is usually too long for my taste. And the streaks that result from too long exposure times are not related to Coma. without guidance system you will never need more than the 30sec you can dial in anyway. You can then just use the 2 or 5sec self release, no need for a remote. Love your blog especially “Making of series” – made me buy a used a7… now I already own an Irix 15mm f2.4 (which you don`t like particulary if I read correct :-)) and was wondering if any other legacy manual (SLR) lenses in the 35-50mm focal lenght could/would give good results making panos like you did here with VM 35mm f1.7? Sigma Art 35mm 1.4 is your best option by far. The older fast SLR lenses are not much cheaper but way worse corrected in terms of Coma. I guess after reading about the FE 28mm 2.0 on your site this should probably be the best choice if low weight/size and cost are what you are looking for, right? It is probably the best native low cost option, yes.